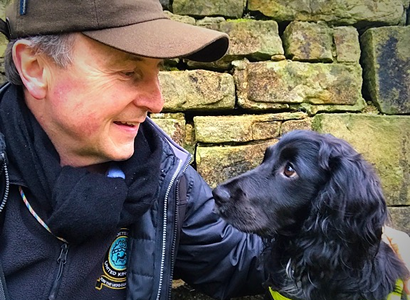 Join us for an evening with Colin Butcher as he talks about his new book Molly and Me – an extraordinary tale of second chances and how a dog and her owner became the ultimate pet-detective duo. Enter Molly, an unloved and unwanted cocker spaniel on a rescue website. Clever and charismatic, she melted Colin’s heart and the two became instantly inseparable. Colin’s detective skills combined with Molly’s intelligence, tenacity and sense of smell made them the ultimate team and it wasn’t long before they were cracking cases and solving crimes across the country. From the search to find Pablo the ginger tom who was kidnapped in Devon to unearthing a treasure trove of stolen jewels in a north London wood, the duo have many bizarre encounters and make plenty of new friends along the way. Charming, moving and thrilling, Molly and Me is the story of a rescue cocker spaniel with a troubled past who – thanks to the love and devotion of her owner – finds a new life, a new purpose and a forever friend. Come along and meet Colin and Molly and hear their heart-warming story.